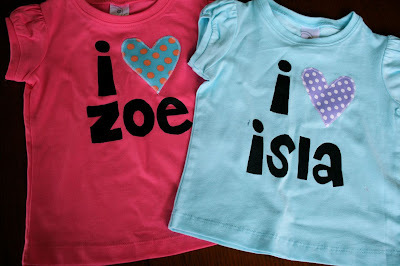 make it perfect: .For little girl #3. 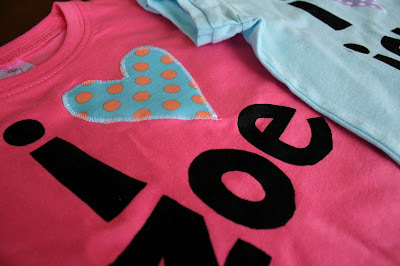 Inspired by these cute little suits and with the help of some fabric paint and freezer paper (and this tutorial) I made her some t-shirts to wear when she gets a bit bigger...freezer paper stenciling is fun... Edit...a few people have been asking about the supplies I used for this project. I bought the fabric paint from www.jovian.com.au - Pebeo Setacolor Opaque. Since then I have discovered you can buy an additive that you mix with regular paint to turn it into fabric paint from Spotlight...this would be better as you can have ANY colour. The freezer paper was from my local patchwork store. You actually can't buy this kind of freezer paper a regular supermarket in Australia (that I am aware of anyway). It is great stuff, shiny on one side and adheres to your fabric when you iron it on. Then easily peels away when you are finished with it without affecting the fabric. It can be re-used too. Awesome!! We love freezer paper too!! I'd love to know what paint you use? ?